With a thunderstorm booming over the Pimlico racetrack just minutes before the start of the day's biggest race, the Preakness saw one of its best performances in years with American Pharoah cruising to a seven lengths victory. 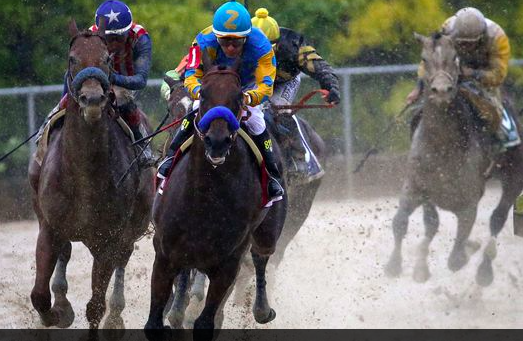 American Pharoah blazes off the backstretch in a driving rain to take the Preakness yesterday. American Pharoah's seven length win is the biggest margin of victory since the record setting 11 ½ lengths set in 2004 by America's most beloved horse Smarty Jones. The victory in chaotic weather conditions sets up a potential Triple Crown showdown with several Kentucky Derby horses rested in wait to stop American Pharoah from the ultimate prize. Next month it's the ultimate Test of the Champion Belmont Stakes with a full mile and a half test. A record setting crowd of more than 120,000 saw Smarty Jones go for the Triple Crown in 2004, a Belmont Stakes record. Talking Ed Note: With Smarty Jones' record Preakness victory highlighted in the news, could similar big news be exploding off the backstretch for Da Horsey?